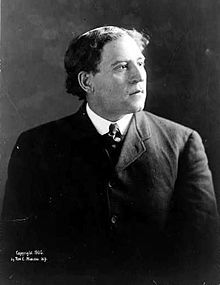 Amos Alonzo Stagg (August 16, 1862 – March 17, 1965) was an American collegiate coach in multiple sports, primarily football, and an overall athletic pioneer. He was born in West Orange, New Jersey, and attended Phillips Exeter Academy. Playing at Yale, where he was a divinity student, and a member of the Psi Upsilon fraternity and the secret Skull and Bones society, he was an end on the first All-America team, selected in 1889. He was elected to the College Football Hall of Fame as both a player and a coach in the charter class of 1951 and was the only individual honored in both areas until the 1990s. Influential in other sports, he developed basketball as a five-player sport and was elected to the Basketball Hall of Fame in its first group of inductees in 1959. A pitcher on his college baseball team, he declined an opportunity to play professional baseball but nonetheless influenced the game through his invention of the batting cage. He went on to earn an MPE from the Young Men's Christian Training School, now known as Springfield College. On March 11, 1892, Stagg, still an instructor at the YMCA School, played in the first public game of basketball at the Springfield (Mass.) YMCA. A crowd of 200 watched as the student team crushed the faculty, 5–1. Stagg scored the only basket for the losing side. Stagg became the first paid football coach at Williston Seminary, a secondary school, in 1890. This was also Stagg's first time receiving pay to coach football. He would coach there one day a week while also coaching full time at Springfield College. He moved on to coach at the University of Chicago (1892–1932), and then at the College of the Pacific (1932–46) after he was forced to retire from Chicago at the age of 70. During his career, he developed numerous basic tactics for the game (including the man in motion and the lateral pass), as well as some equipment. Stagg played himself in the movie Knute Rockne, All American released in 1940. From 1947 to 1952 he served as a co-head coach with his son at Susquehanna University in Pennsylvania. In 1924, he served as a coach with the U.S. Olympic Track and Field team in Paris. Known as the "grand old man" of college football, Stagg died in Stockton, California, at 102 years old. In 1952, Barbara Stagg, Amos' granddaughter, started coaching the high school girls basketball team for Slatington High School in Slatington, Pennsylvania. Two high schools in the United States, one in Palos Hills, Illinois and the other in Stockton, California, and an elementary school in Chicago, Illinois, are named after him. The NCAA Division III national football championship game, played in Salem, Virginia, is named after him. The athletic stadium at Springfield College is named Stagg Field. The football field at Susquehanna University is named Amos Alonzo Stagg Field in honor of both Stagg Sr. and Jr. Stagg was the namesake of the University of Chicago's old Stagg Field where, on December 2, 1942, a team of Manhattan Project scientists led by Enrico Fermi created the world's first controlled, self-sustaining nuclear chain reaction under the west stands of the abandoned stadium, as well as Stagg Memorial Stadium, Pacific's football and soccer stadium. Phillips Exeter also has a field named for him and a statue. A field in West Orange, New Jersey on Saint Cloud Avenue is also named from him. The Amos Alonzo Stagg Collection is held at the University of the Pacific Library, Holt Atherton Department of Special Collections. The Amos Alonzo Stagg 50-mile Endurance Hike is held annually along the C&O canal outside Potomac, Maryland.